It’s perplexing to me that as Canadians we can unite at ungodly early morning hours to cheer on our hockey team as a country, yet when it comes to education we live on seemingly unconnected islands. In my province, Ontario, we have just completed a “visioning” exercise, looking at how to move our public education system from “great to excellent“. In the meantime, in what feels like a different country (because we rarely connect and share what we know), the province of Nova Scotia is about to embark on an education review. 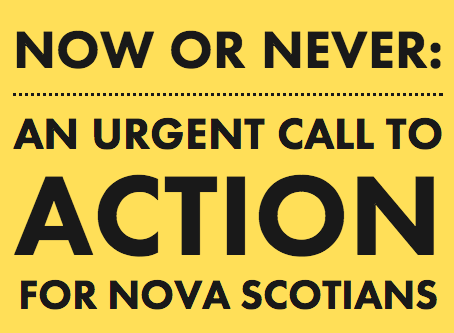 Last week, the Province of Nova Scotia launched its urgent call for change. 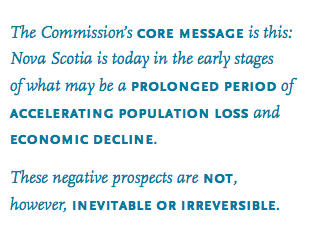 The report states that a crisis exists that threatens the standard of living of Nova Scotians. It outlines 19 goals and 12 long-term strategies that are needed to turn the economy around and stop the current decline. Robert Sutton, in his recent publication “Scaling Up Excellence” demonstrates that using logical arguments to spread the need for change are often not effective, and we need an emotional attachment to an idea to really move change forward. The Ivany Report, with the focus on Urgency and Mobilizing Strengths, has created this “hot cause” to “stoke the engine”. However, critics say that the report, while strong on ideas, lacks concrete policy. As an educator, I read the report looking for how the education system would be redesigned to meet the goals of “One Nova Scotia: Shaping our Economy Together”. With a quarter of the population under the age of 19, it would seem that transforming an economy would certainly require a transformation in how young people were educated. But there is very little in the report to suggest how this might occur. A small section entitled “Excellence in Education and Training” (combining those terms is concerning) suggests that a “rigorous curriculum review” and “setting the bar high” will hold Nova Scotians accountable for reaching their goals. There is essentially no conversation on how a system of schooling, created with an industrial mindset, could now produce young adults who thought like entrepreneurs rather than obedient assembly line employees. 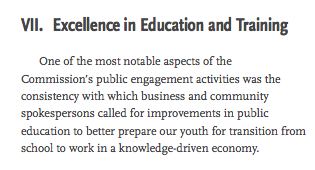 So what, then, should be the purpose of Nova Scotia’s upcoming comprehensive review of the education system? In Ontario, we have learned that public support of public education is critical. In our three priorities, raising the bar, lowering the gap and securing accountability, we have focused on how, as a province, we can believe in what we are doing as being the best for our students. At the same time, research must be central to learning. So what, then, is the role of public consultation? Perhaps the real question Nova Scotians need to answer is “What is School for?” How can we possibly determine what is working, and what needs improvement, if we aren’t in agreement on why we have schools in the first place? Once we know what schools are there to accomplish, there is a world of research available to help move those goals forward. High yield strategies like assessment for learning, and student-work-study teacher initiatives are well-documented. The citizens of Nova Scotia, faced with the findings of the Ivany Report, now need to deeply consider their expectations, their beliefs, and their understanding of the purpose of the school buildings in their communities, and the reasons for the hours that young people spend there every day. What kind of person emerges from the years in the school system, and what kind of province results from that education system? As Canadians, what do we see as the purpose of school? Leading advocates of C21 Canada evangelism like you Donna all too rarely engage in the public discourse over the purpose of schooling. Ray Ivany’s Now or Never declaration and the announcement of a Nova Scotia Education Review seem to have caught your attention and you are rightly troubled by the narrow focus of Nova Scotia’s education policy makers. To them, it’s stall a matter of “integrating technology” into the classroom. Your zeal and courage are all too rare in Canadian education, not to mention your energy and positive optimism. If schools kill curiosity, administration has a way of flattening out imaginative educators bursting with ideas. ONe of the most fascinating recent developments is the appointment of Kyle Hill to the Nova Scotia Education Review. Amazing as it might seem, I’m not sure whether the Minister or leading educrats knew he was co-founder of Teach for Canada. That says it all. What we have lost is the capacity to disagree publicly and to engage in what Sir Ken describes as “divergent thinking.” Far too much of the edubabble coming from “educationists” is “internally-referenced” and therefore simply self-perpetuating, much like the larger system. Without critical, independent thinking, systems perish. It is great that you re-pose the question about the purpose of schooling, and we fully agree with your comment about the poverty of the babbling and twittering conversation about education. Where we disagree slghtly is the emphasis you put on vision and finding something that is emotionally stirring so that the engine of change can be stoked. Surely you don’t just want to go from babbling to roaring. Surely what is needed is a deeper understanding of what is at stake. Perhaps the first (and the hardest) thing to think about is the society that schooling is preparing young people for. You mention your country and the economy, and it almost seems as if One Nova Scotia = Nova Scotia Inc. – as if the country were branding itself as some new franchise. What is this economy that the schools are serving? And what role can the schools possibly play in reversing economic decline? Your post comes close to buying into the idea that the schools might be responsible for economic decline (old, industrial schooling holding back a white-hot post-industrial economy), and might be the key to turning things round. If we look more closely at how the economy has been developing internationally, is that the case? Do we not see seriously dysfunctional tendencies in the economic system, and does the debate about raising standards at school not help to conceal those by propgating the myth that if only we can produce school-leavers who are top-class entrepreneurs who have kept their childhood level of creative genius despite the cultivation of a tiger-like goal-orientated discipline that the economy will boom again? And there is a risk that the question about the purpose of schooling assumes that there can be a simple fit between school and the rest of society. There could only be a simple fit if society was itself simple. The problem is not just that society is complex, but that it is contradictory. Society is at odds with itself. Here in Greece those tensions are most palpable. Here in the birthplace of democracy that great political tradition is being dismantled. The old assumption that democracy and capitalism exist in a perfect symbiosis is proving to be false. The gloves are coming off, and the fighters in the democratic corner of the ring are losing. If society is at war with itself, then perhaps we can’t answer the question about the purpose of schooling without taking sides. Your hymn to entrepreneurialism sides with the economic forces for which democracy is little more than an optional extra. Are you happy with that? Is that what the vision of One Nova Scotia will mean in practice? The choices are difficult, and they are essentially political. If the conversation about education does manage to go beyond babbling, let’s hope that it manages to deal more thoughtfully with these deeper political issues.